So, what else can I do in Santorini? The boat tour that we specifically went on was one from Santorini Day Tours. I'll link it here - Santorini Caldera Cruise, but feel free to check out other boat tours as well. The price was slightly higher than the other boat tours, but I think it was well worth it (just check out the reviews!). Some other tours can be found here from this site - Viator. Many of the boat tours will offer the same thing but will differ in what they allow you to do. They first picked us up from downtown Fira in an air-conditioned van that took us to the pier that the boat was located. Another tour had recently finished, and they were in a great mood. We could tell the tour was going to be good. The boat was a brand new deluxe catamaran that was recently purchased from France. Before we got on board, the crew asked us to leave our sandals/shoes, since the boat was so new. Once we arrived on board, the crew gave us a quick intro, some wine and Greek beer, and we were off into the sunlit glistening sea. The sea breeze blowing our faces as we lounged around on the boat, we enjoyed the views of passing clifftop houses, the caldera, and the Aegean Sea. Our first stop was the Red Beach. We couldn’t get too close to the shore, but the captain stopped the boat for us to swim out in the open ocean. Other boats were there, but we had plenty of space for our own private swim. The water was crystal clear and we could easily see the bottom of the ocean floor with the available snorkeling gear. The crew threw in some bread crumbs into the water and we were then swimming with some fish! Our second stop was the White Beach and we were served a meal that the crew had freshly cooked up on the boat. After enjoying a delicious feast of spaghetti, grilled chicken and fish, greek salad, fresh bread and fruits, we enjoyed another leisurely swim out in the crystal clear waters. We got back into the boat and headed to the hot springs besides Nea Kameni. The hot springs are warmed through the active volcanoes and are much warmer than the surrounding waters. As we got closer and closer to shore, the rocks on the bottom of the springs became sharper. So, instead of swimming all the way to shore, we decided to stay for a bit in the spring. One thing to note is that the water at the hot springs is “yellow” due to sulfite, which is supposed to be good for your skin. After swimming back to the boat, we headed back to the port. Since we took the evening cruise, the captain stopped the boat for the beautiful Santorini sunset. 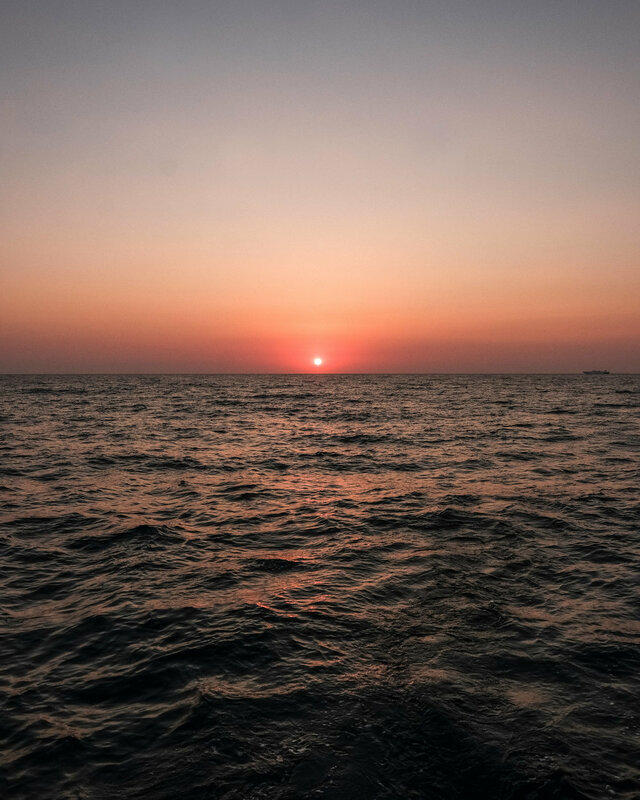 We watched it slowly vanish past the horizon while lounging around on the deck of the boat. Once we reached the port, the crew returned our sandals/shoes and asked us to leave some good reviews on the website. Overall, it was a great way it was a great way to swim at multiple beaches, wade into an active volcano site, and watch the Santorini sunset. They also feed you generously and give you plenty of alcohol as well! Both my girlfriend and I thought this was the highlight of our time at Santorini, and we really enjoyed the tour. Out of the must do things in Santorini, a boat tour is a must-do. If you like books, you’ll really like the Atlantis Bookstore. Located in the middle of Oia, across the street from a hipster clothes shopping area, it is an quirky, independent bookstore that has been rated as one of the top bookstores in the world. It’s been rated so highly for a reason - there are books for every audience and they even have first edition books that are signed! The bookstore looks like the home for a hobbit and has books on every spare part of the wall. They also have a terrace upstairs that has a very nice view. Besides the above, there are tons of places to go shopping, eat, and drink. There are several bars that are highly recommended such as Casablanca, Kira Thira Jazz Bar, and etc. In regards to shopping, when we were walking around Fira, nearly on every street, there was some kind of shop. I think that you will also have no problem finding something to buy as well. After hiking, we went to the "Secret Santorini Beach" near Oia. The path to the secret beach starts by finding the winding trail that goes down to Ammoudi Port. You will want to wear some sturdy footwear, at least some sandals. You'll have to wander through some donkey doo-doo and also wonder why you're following my advice, but once you get to the bottom of the trail, you'll be happy you listened. Watch out for the donkey doo-doo! When going down the trail, make sure to take your time and take some pictures, as it's quite a long way down. Also try not to breath through your nose. If you're winded at the bottom, make sure to stop by one of the local restaurants on the port. However, if you're impatient like myself, head left after exiting the stairs and go past the seaside restaurants. The trail here is rocky and the rocks are jagged, but as long as you take your time to cross the path, you'll be fine. Finally, you'll have arrived at the "Secret Beach". Most likely, others will have read my blog post and have found this beach. However, there is plenty of space for everyone to have their own space to sunbathe, snorkel, swim, or even jump off the cliff! The water did not move fast at all, and was pretty calm. I had no difficulties swimming in the water. However, if you do not know how to swim, please be careful! A closer look at the rock at Ammoudi Beach. On the left side, there is a ledge that you could jump off. After hanging out and lounging around, it's time to walk back up to town. Like before, play frogger with the donkey doo-doo and take plenty of pictures while going up the stairs. There are plenty of spots for you to rest and take a breather. If you've timed this just right, by the time you've reached the top of the stairs, you'll be greeted by the sunset crowd and be able to join another gorgeous sunset! 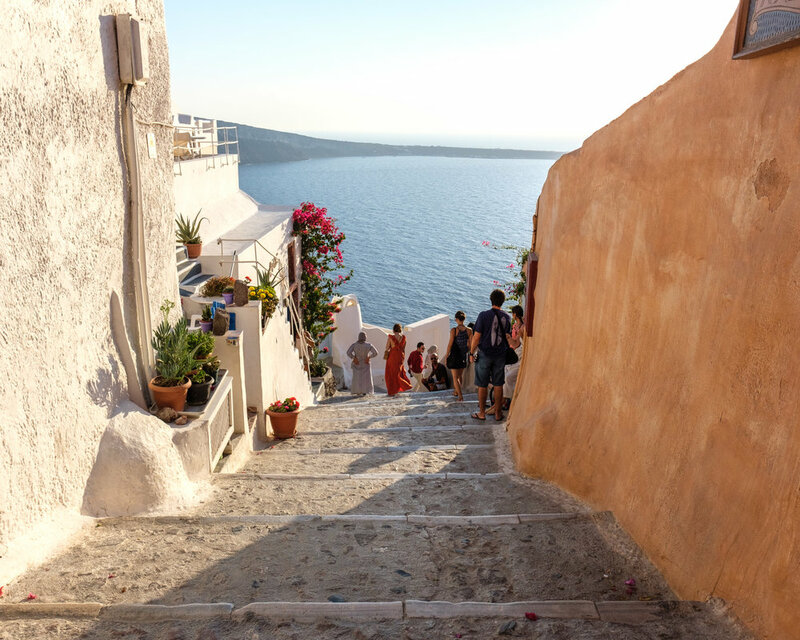 What are some of the top things to do in Santorini? My first recommendation would be to walk from Fira to Oia or Oia to Fira. 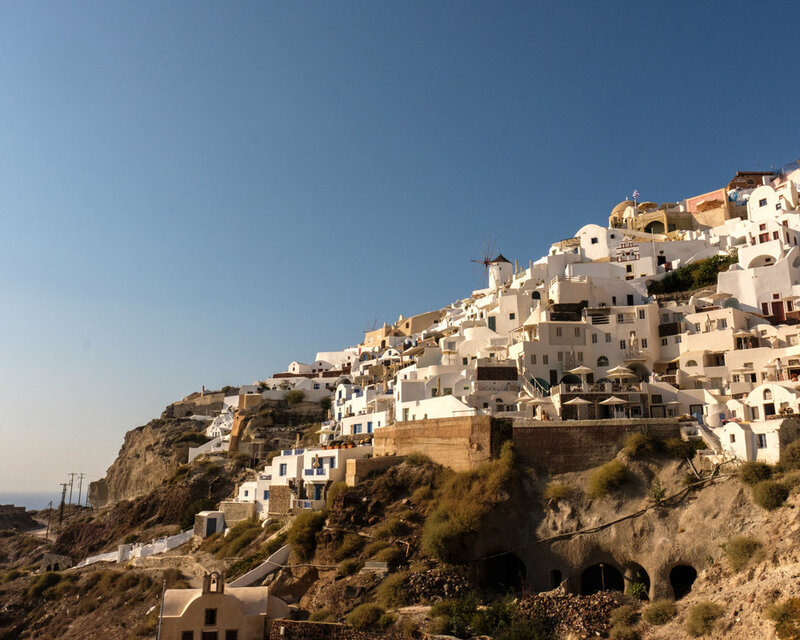 This will take roughly 4 hours (depending on how many times you stop) and goes through the streets of Fira, Firostefani, Imergovigli, and reaches Oia. I know, it sounds like a really long time to walk, however, the walk is very doable and the views throughout the walk are incredible. Since this is quite a long walk and some parts of the walk are not shaded, I recommend starting very early in the morning or starting around late afternoon. When we walked, we made the mistake of starting around lunchtime and it was quite hot! I also recommend bringing plenty of water and a hat of some sort, if walking during the summer. Since our AirBnb was in Oia, we took a bus to Fira early in the morning. We then started the walk from our drop-off near Hotel Atlantis and continued through the streets of Fira. As we were heading to the bus stop to go to Fira, this is the view we saw in Oia. Not bad eh? We took a lot of pictures and shopped at some of the stores, and of course stopped for some Greek coffee. This delay in our route caused us to suffer some later in the walk due to the relentless sun, but it was nice to explore Fira before the crowds clogged the streets. Obligatory photoshoot under some flowers. Lots of paths to explore but not enough time! Sneaky glimpse into one of the many hotels in Fira that overlook the caldera. As we passed Fira and arrived at Firostefani, the view back to Fira was quite amazing. Even though it was getting hotter, we stopped by for a smoothie and had multiple water breaks in the shade. Looking back at Fira from a little further up the hike. As you can tell, it was hard to just keep going with this kind of view behind us. Finally we passed Firostefani and reached Imergovigli. As we got into town limits, we saw the sweeping view of the caldera. Because we were both hot, we really wanted to jump into the clear blue waters below. The hike goes all along this path with the view of the caldera on your left. As we passed Imergovigli, the hike started going up a hill and we could see for miles around. Besides ourselves, there were many other groups of hikers going up the hill. If you feel like you might be lost by this point, make sure that you pass a church at the top of the hill. The church might not be open, but when we went by it, there was a fruit vendor at the side of the church, who was selling some refreshments. Once we passed the church, the path went on a descent. Since it wasn’t paved, it was semi-difficult to walk through. After chugging through the hike, at the bottom of the hill, we saw a hotel. After passing the hotel, we had to walk on the highway but shortly after we stopped at a refreshment stand. The rest of the hike was pretty straightforward, and does go up a hill and back down. We reached Oia about 30 minutes later. Santorini Dave has some great step by step instructions that I'll link here for the entire trip - which definitely made navigating the hike easier. 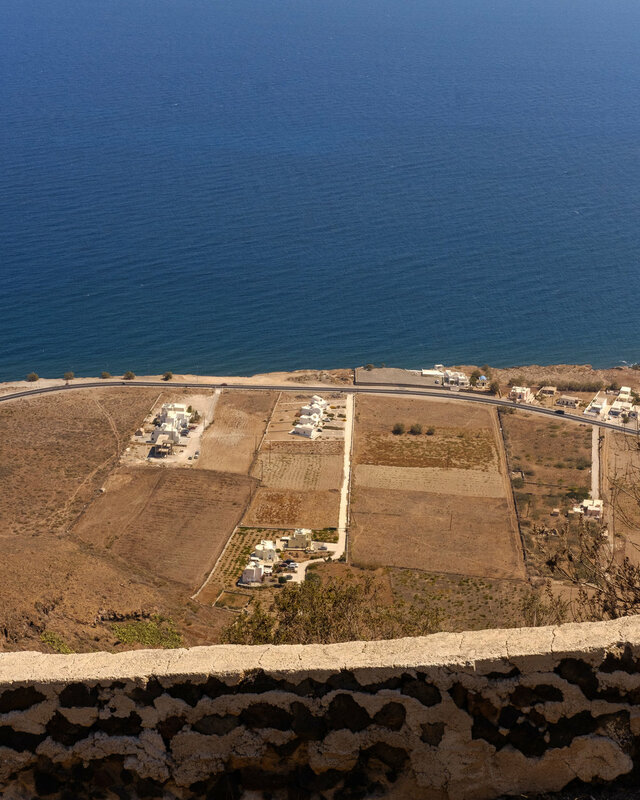 Check out Part 2 for Top Things to do in Santorini! 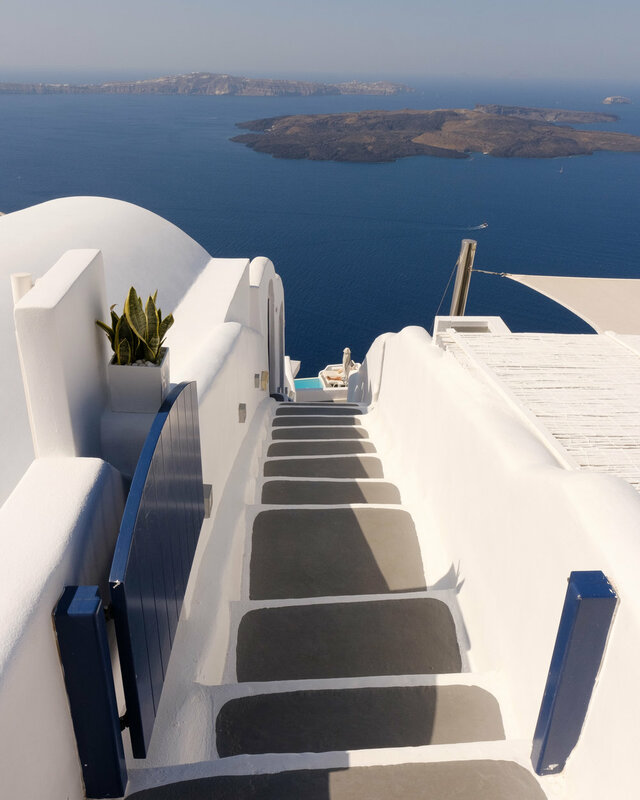 You're about to go to Santorini - congrats! 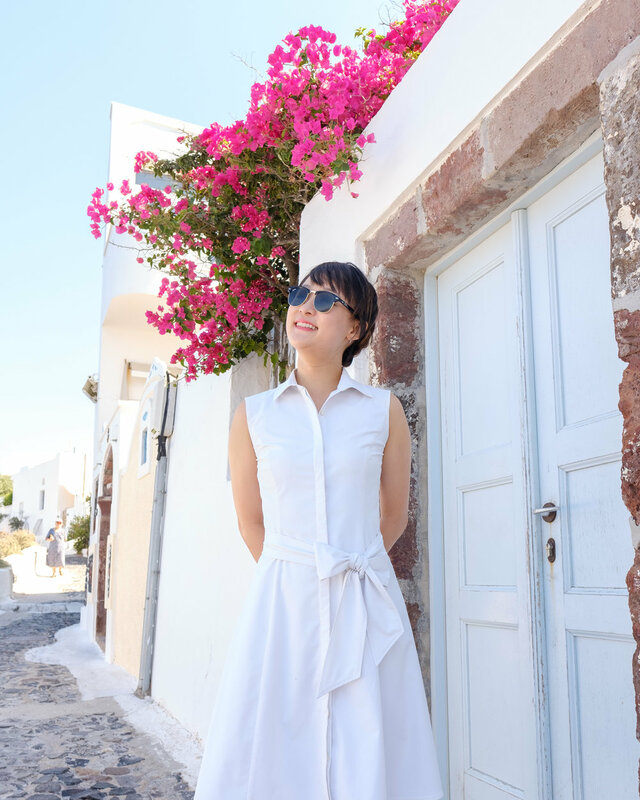 I really enjoyed Santorini and I hope you do as well! Here are some quick tips that should help with your trip planning. There are a lot of hotels in Santorini and a lot of them have fantastic views of the Mediterranean Sea. There are two main locations in Santorini that you can use to start looking for a place to sleep. One of them is Fira and the other is Oia. The difference between the two is that Oia is by far the prettier of the two. Fira, on the other hand, is in the middle of Santorini and will be easier to get to other locations in Santorini if you choose to do so. Since we had an Airbnb right in the front row, we were able to order take-out (Greek salad and grilled kebobs, of course) from a nearby Greek restaurant, buy some wine/beer/snacks from the nearby convenience store, and sit down at our own private balcony to view the sunset. Sunset at the Caldera from our private balcony! Since Santorini is a very robust and lively town, there are quite a few choices for eating. Thankfully, the prices are not too expensive so wherever you go, I would suggest trying something new. All of the seafood choices we had were very good. The gyros were also great. And of course, make sure to get your daily veggies with the Greek Salad! After eating, we would always get some dessert. Yogurt gelatos quickly became our favorite and there are many locations that have some great tasting yogurt gelatos. Side note, why aren't yogurt gelatos available in the US?! You could rent a car, 4 wheeler, all-terrain vehicle, etc and drive slowly around the island like a tourist and be responsible for parking. OR you could ride the super affordable bus that goes all over Santorini. And, in the off-chance that you really need it, order a taxi. The taxis in Santorini are beefed-up minivans that are kind of like a miniature bus.